Dashboards present up-to-date summary and detailed information on the status of applications, servers, and networks. Heroix, developer of application performance and network monitoring software, today launched a new dashboard for Heroix Longitude, adding even more ease-of use for both IT and non-technical staff to what is regarded as the most affordable monitoring solution on the market today. These new dashboards present up-to-date summary and detailed information on the status of applications, servers, and networks. The visual displays make it even easier and faster for IT system administrators or business users to see, in a single glance, any threats to continuous IT services. By viewing summarized performance information via large, color-coded pie charts, Longitude users can see immediately if an application or server is at or approaching a pre-determined threshold that could create problems for individual or groups of users. 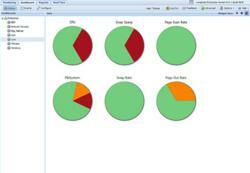 If a pie chart is all green, the user knows everything is running as planned. If a wedge of the pie is orange or red, they can immediately click on that segment and see the potential problem. This allows for swift diagnosis and keeps systems running smoothly and meeting promised SLAs. Many monitoring software packages on the market today typically use lists to show which IT components are working as planned and which may be approaching or in troubled states. These lists are not concise or visual enough for fast evaluation of potential problems; they often extend beyond what is visible in a single window. Scrolling through lists takes time and problems are often overlooked. “Another aid that Longitude has always provided – fast and easy customization – has been extended to both our dashboard and reporting, so that companies can make the software truly meet their own unique needs,” continued Levin. For example, Longitude’s new grouping capability allows users to view their IT resources based on line of business, geography, or any other organizational groups of their choosing. The customization takes only a few seconds to set up and the process is so intuitive that even users brand new to Longitude can do it quickly. Heroix has also completely redesigned the reporting options in this new version of Longitude using the latest version of Ext JS. Users can get to reports faster, with more detail and fewer clicks and see reports in easy-to-read full-screen graphics. With this release, the company has added monitoring for the newest version of Microsoft SQL Server: SQL Server 2012. Longitude monitors a broad range of platforms (Microsoft Windows®, Red Hat®, SuSE®, AIX®, HP-UX®, Solaris® and VMware®) and categories (OS, Web, database, messaging, network, infrastructure, and user and business metrics). The software provides comprehensive performance monitoring, immediate results, rapid deployment, ease-of-use, agentless architecture, and intuitive Web interface, in an affordable solution. Longitude V8.0 is available now. Please visit Heroix or call 800-229-6500 or 781-848-1701. Heroix also offers a 14 day free trial of all Longitude Editions. Pricing starts at $399. Heroix has provided best-of-breed application performance and network monitoring solutions for 25 years to companies like, Honeywell, Kaiser Permanente, Motorola, Tembec and Young Broadcasting. Heroix Longitude is the fastest, easiest-to-use, and most affordable application and network monitoring software available today. This proven, self-service solution optimizes the availability and performance of applications, databases, systems, IT infrastructure and VMware across multiple platforms.